Eldon "Bud" Lewis McAfee, Jr. 70, of Hannibal passed away Thursday, December 28, 2017, at 10:32 a.m. at Blessing Hospital in Quincy, IL. Funeral services will be held 10:00 a.m. Wednesday, January 3, 2018, at the Smith Funeral Home & Chapel. Bro. Bob Craig will officiate. Burial with full military honors provided by the Missouri Military Funeral Honors Team will be in the Grand View Burial Park. Visitation will be held 5:00 to 7:00 p.m. Tuesday, January 2, 2018, at the Smith Funeral Home & Chapel. Bud was born on March 25, 1947, in Hannibal, MO the son of Eldon Lewis and Erma Jean (Garner) McAfee, Sr. Survivors include his mother, Erma Jean McAfee of Hannibal, MO; five children, Kevin L. McAfee (Stephanie) of Palmyra, MO, Chad A. McAfee (Shanda) of Hannibal, MO, Lance E. McAfee (Heather) of Vandalia, MO, Stephanie A. McAfee of Hannibal, MO, and Adam McAfee of Hannibal, MO; one brother, John "Andy" McAfee of Hannibal, MO; one sister, Pat Buffington of Perry, MO; longtime companion and best friend, Sarah Elizabeth Miller of Hannibal, MO; fourteen grandchildren, Alexandrea Pugh (Travis), Noah McAfee, Dalton McAfee, Kylie McAfee, Kaisen McAfee, Madison Raynor (Brent), Easton McAfee, Makayla McAfee, Jacob Green, Alissa Green, Abbie Green, Kaitlyn McAfee, Clayton McAfee, and Summer McAfee; one great grandson, Carson Raynor and one great grandchild due in May. Also surviving are several nieces, nephews and cousins. In addition to his father, Mr. McAfee was preceded in death by one step daughter, Michele Huss and sister-in-law, Barbara R. McAfee. Upon graduating from Hannibal High School in 1965, Bud proudly served his country in the United States Air Force during Vietnam as a Gunners Mate. Professionally Mr. McAfee worked as a Hannibal Police Officer during the 70's. He later worked as an insurance salesman and car salesman before retiring due to health reasons as an over the road truck driver. Bud was an avid outdoorsman, he enjoyed fishing on the Mississippi River and nearby streams and ponds, deer and turkey hunting and camping with family and friends. He also enjoyed watching old westerns on TV and cherished spending time with his dogs "Lucy", "Mack", and "Rufus". 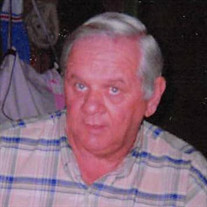 Bud's biggest love was spending time with his family, especially during BBQ's and fish fry's. Mr. McAfee was a Baptist by faith. Pallbearers will be Chad McAfee, Kevin McAfee, Lance McAfee, Adam McAfee, Andy McAfee, and Easton McAfee. Honorary pallbearers will be Bud's grandchildren. Memorial contributions may be made to the James E. Cary Cancer Center, NEMO Humane Society or Mr. McAfee's family, in care of the Smith Funeral Home & Chapel.